This Savannah wall mounted shower seat is a generous seat on this shower stool ensuring comfort and security and can be folded neatly against the wall when not in use. Has an optional backrest. 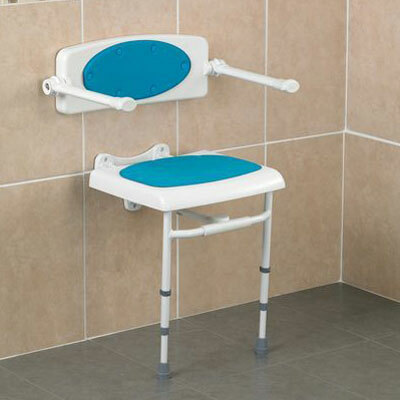 This Savannah wall mounted shower seat has a generous seat on this shower stool ensuring comfort and security whilst showering. The seat section can be folded neatly against the wall when not in use. The standard seat is supplied without the backrest with arms shown in the picture, or the blue cushion pads. The optional backrest has arms that foldaway independently and can be mounted at a height on the wall to suit the user. The final optional extras are the blue clip on cushions, which can be selected for the seat, the back rest or both. Product Seat Size 17 x 14¼"
Seat height 18 x 23"